The Clavinet.Com tuning key is sized exactly to fit the Clavinet's extra wide tuner slots and encapsulates the tuning heads for precision tuning. Gone are the days of trying to tune a clavinet with a slipping and sliding screwdriver! 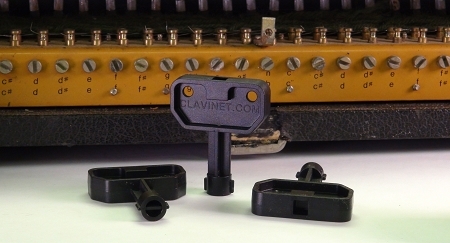 The Clavinet.Com tuning key also features an internal 1/4" square drive socket that you can use with any power drill, so you get the best of both worlds - Rough tune with a drill and then fine tune by hand! Fits in your pocket, or use the handy holes to attach it to a keychain or necklace, so you'll never be without this essential tool!